These adult students, Sandra, Natalie, Glenda and Jonus, attended my Site Reading Instantly workshop June 4, 2017, learning how to site read faster, recognize pitch and improve playing by ear. This is a brand new system built on the book, Site-Sing Any Melody Instantly, by Mark Phillips. Susan has been teaching for 19 years. 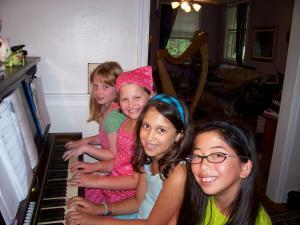 Her speciality is working with beginning to advanced students, children and adults on the harp or the piano. Her private studio is equally split between adult students and children. The children range in age from 7 to 17 years old, the adults 25 to 70. She especially enjoys teaching mature students. She teaches classical, ensemble (duets), blues, jazz and improvisation. 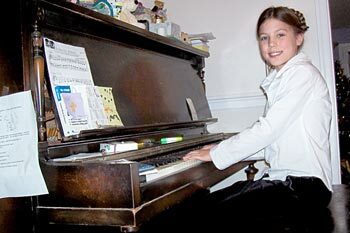 Her students perform at group lessons during the year and attend piano camp and harp camp in the summer. They also perform each year at Fall Fest held at Agnes Scott College, sponsored by Decatur Music Teachers Association, where they memorize pieces, play scales and cadences for a judge. Susan’s piano instruction and her skill at accommodating the ever-changing stages and moods of childhood have been invaluable. These gifts have helped my daughter to grow in so many ways that reach beyond the piano. 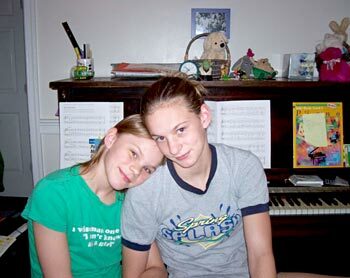 My daughter started with Susan at age 6. She was headstrong and afraid of strangers and somewhat unforgiving of even the gentlest of criticisms. Susan forged ahead with great insight and delicacy and, as a result, our child learned to love music and to play an instrument, and to appreciate the more elusive gift of allowing someone to help her. The security that Susan imparted helped her to become a confident performer as well. Many, many thanks. My favorite things and moments about being taught piano by Susan is when we would laugh and make jokes about her toys. The thing I didn’t like was doing my theory. I wouldn’t ever do it. But very rarely I would surprise Susan by coming to lesson and having finished my theory. I had a great time. The most challenging thing about piano lessons with Susan was getting every measure, note and song absolutely correct, without the slightest wrong note.